Now that you’re starting your new business on Amazon, you have to be careful about the cost that you would incur in the next course of time. 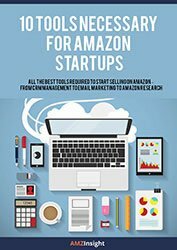 New Amazon sellers need to manage several things from inventory, logistics and marketing to have a good start of the business from the get-go. To perform different tasks new sellers need several different tools. To help you out in the research process of all the required tools we have put together a list of 10 tools in this eBook that will help you in different aspects of the online selling business. Download this ebook and learn how different online tools could help you in achieving different tasks of your business and the best part we have also included top of the line free tools. What kind of tools are listed?